More than a month after it was closed and thousands of visitors were evacuated during a firestorm, the Glacier National Park’s iconic Going-to-the-Sun Road reopened Monday to private vehicle travel between Apgar and Logan Pass. That means the entire length of the road can now be traversed – from West Glacier to St. Mary. In addition, the developed area at Avalanche Creek has reopened to the public, including the day use areas, restrooms, Trail of the Cedars and the Avalanche Lake Trail. Flattop Trail and The Loop Trail also reopened Monday. However, drivers cannot stop along the road between Lake McDonald Lodge and the Avalanche Creek area – as firefighters are still working the 14,522-acre Howe Ridge fire. That’s the blaze that closed the Sun Road on Aug. 12 when it blew up on a hot, dry, windy afternoon and evening, burning a number of historic cabins and threatening the road. 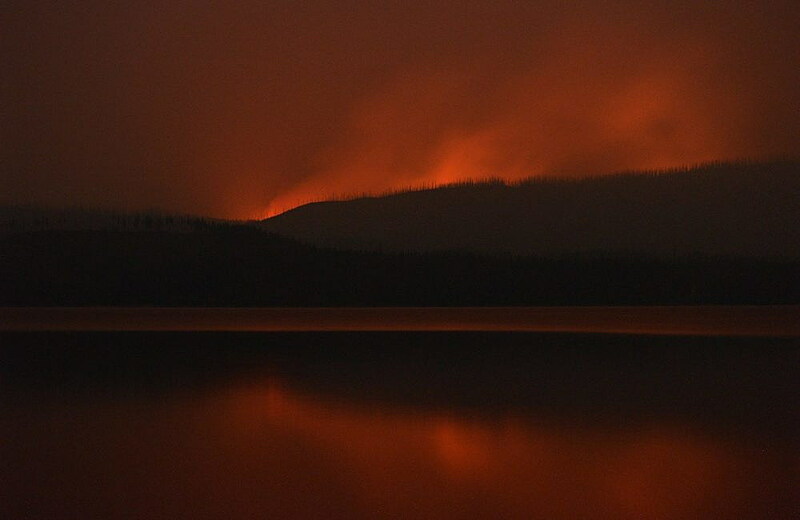 Within a matter of hours, campgrounds and roads were evacuated, as was Lake McDonald Lodge – which closed for the season about a week later. The fire is still burning, but picked up between a quarter inch and a half inch of rain on Sunday, and light snow fell on the peaks. Overnight temperatures dropped to near freezing. In his Monday morning report, incident commander Mike Goicoechea said firefighters removed water pumps and disassembled hose lays at the Fish Creek campground on Sunday, and are now moving on to removal of the structure protection wrapping from a backcountry cabin west of the fire. “Crews remain ready to reduce hazards and provide structure protection throughout the fire area if needed,” he said. The fire is expected to continue burning until winter fully sets into the park. Glacier officials said Monday that winter weather already has arrived in some areas of the park, and snow has fallen intermittently at Logan Pass. They warned that visitors should come prepared for changing and potentially cold weather. Access to Logan Pass will close on or before the third Monday in October for the winter, depending on weather conditions. This year, that date is Oct. 15, so Oct. 14 is the last day to drive the entire length of Going-to-the-Sun Road for 2018. A culvert project near Apgar is scheduled to begin on October 15, and will require a temporary road closure at the foot of Lake McDonald from Oct. 15-19 before the road reopens to Avalanche, as is customary for the fall season.